Many thanks to Jane Burrage and Gitte's neighbour Kat for the photos. 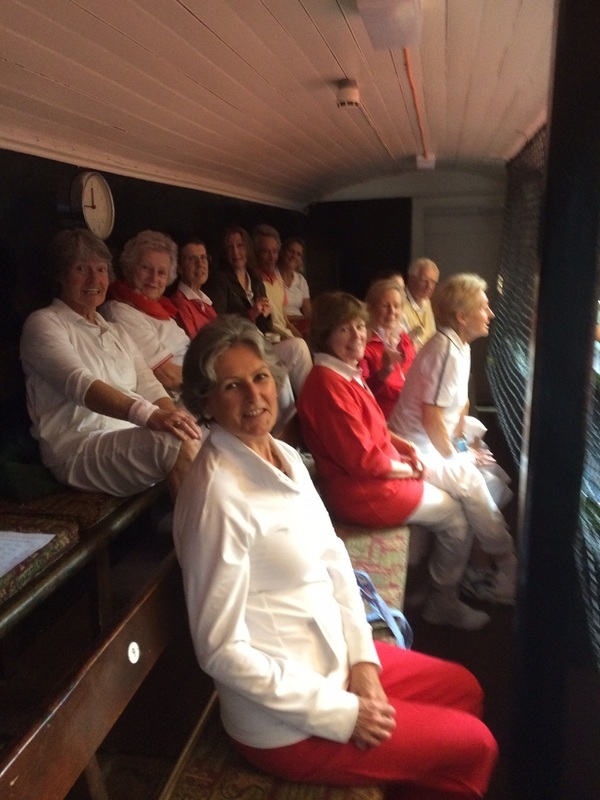 On April 24th, a group of friends gathered at the Royal Tennis Court, Hampton Court to celebrate Gitte Dunkley’s 80th birthday. 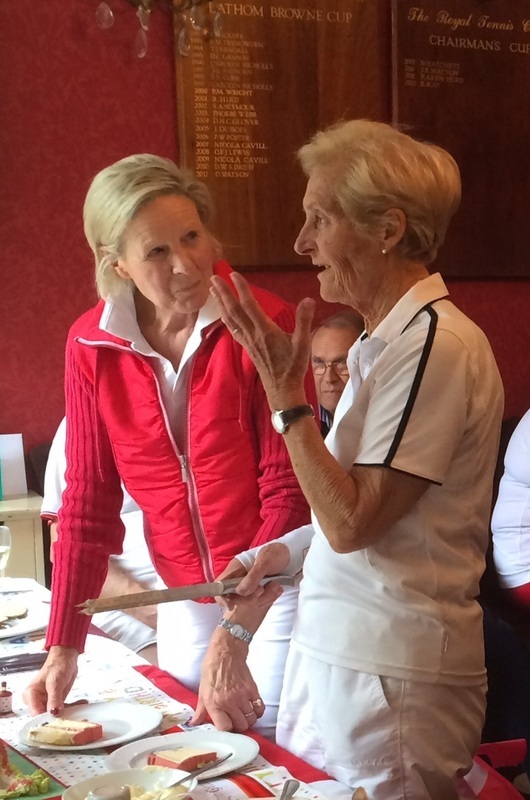 Caroline Harding and Gitte’s daughter Charlotte had organised the party: tennis from 10.00, a break for lunch at 13.00 and some more tennis from 14.00. Gitte knew that she was going to be playing tennis, but the full extent of the event was kept a secret. She was obviously overwhelmed to see so many friends and hugely enjoyed the excellent lunch which had been contributed by the ladies present, with wine provided by the gentlemen. Charlotte had organised a brilliant cake in the form of a tennis court and Caroline a beautiful glass bowl engraved suitably to commemorate the occasion. Players had been asked to wear red and white (Nick Wood gave us special dispensation to break the normal dress code) being the colours of the Danish flag and at least one person sang Happy Birthday in Danish along with the English version. Gitte’s son-in-law, Toby, spoke for us all, wishing Gitte all the best for the future and expressing appreciation for her friendship over the years. An added feature of the tennis was a helium-filled 80th birthday balloon strung over the marker’s box - if it were hit, the hitter immediately won the point. It was hit on a surprising number of occasions but we’re not sure whether intentionally or accidentally. A very happy day and lovely to catch up with so many friends. Congratulations and thanks to Caroline Harding and Charlotte for their brilliant organisation.